Faiz Ahmed Faiz, is one of the most famous poets of Urdu Language. He was born on February 13, 1911 and passed away on November 20, 1984. I was thinking today of my favourite verses of Faiz from his priceless collection. It was indeed a challenging task however I was able to come up with one that always captures my heart and soul. Dhal gaya hijr ka din aa bhi gaye vasl ki raat. Iqbal Bano has immortalized these verses through her rendition and given life to each word through the pitch and tone of her voice. I feel there could not have been a better use of each urdu word utilized beautifully to express the feelings of yearning and love. The legacy of Faiz Ahmed Faiz is diverse and wide spread. He is one of the most famous Urdu poets in Pakistan and around the world. His writings continue to inspire and draw people towards Urdu. 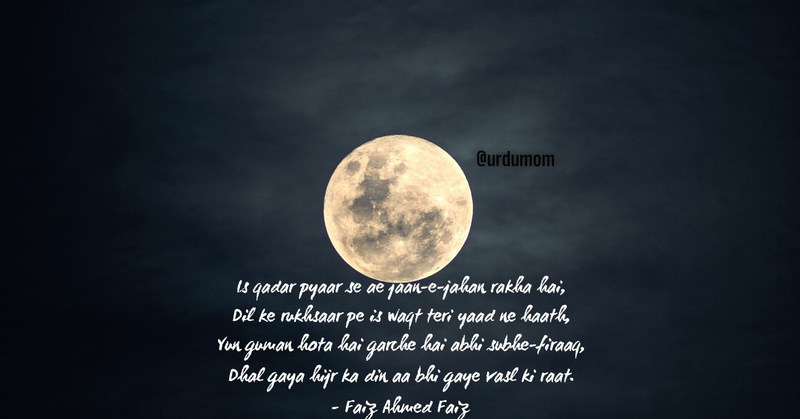 If I sit down to write all my favourite verses of Faiz I would definitely run out of space and time. That is why I challenged myself to choose one today. If you had to pick your favourite verses of Faiz, what would you share? Would love to hear from you! Bol Ke Lab Azad Hain Teray! Previous Post Eight Fun Ideas for Girls’ Night Out! Iqbal Bano, Abida Parveen and Nayyara Noor had immortalized Kalam-e-Faiz. I love Faiz. I have so many folded pages in my Nuqsa-e-Haye-Wafa and I have two copies of the book (standard and pocket size)! Here is one of my favourites.